Around 130 dancers from nearly 20 countries competed in St. Petersburg, Russia, from 5-6 September, for the first IPC Wheelchair Dance Sport World Cup. Amongst these were delegations from: Israel, Belgium, Austria, Korea, Hong Kong, China, Kazakhstan, Slovakia, Germany and others. 1. 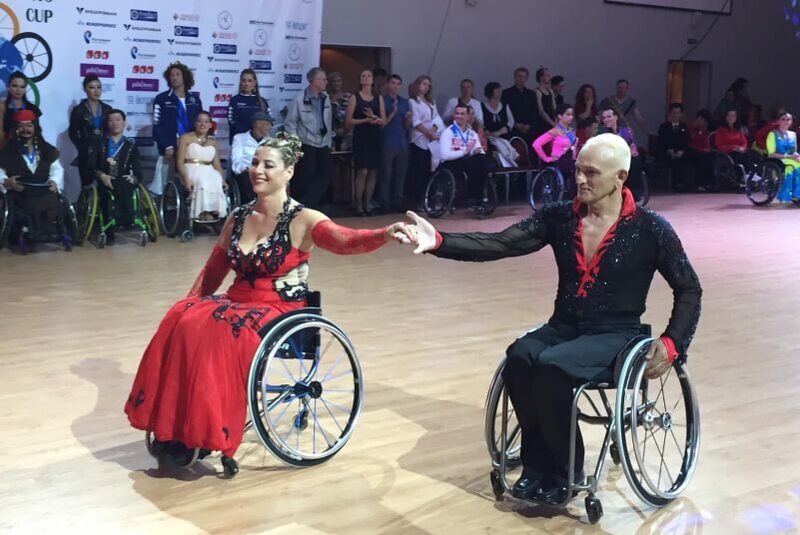 Vital Zinger and Sean Ziv competed in the “Combi” classification (a mixed couple of one standing partner with one wheelchair partner) dancing in the “Latin” dance and took the 5th place. In the “Free Style” Show, they took 5th place and Vital also competed as a solo dancer with other girls in her class in five different dances and took the 5th place. 2. Shimon Hatam and Liron Barak – a new couple who have only been dancing for the past 4 months, competed in the Latin Class and in the Show Dance and reached 6th place. 3. Menny Glass and Anastasia Berginski competed in the Show Dance and won the 1st Place! 4. Sami Dahan and Maytal Wax – a new couple, both in wheelchairs (“Duo” Class). This was their first international competition as a couple. They won the 4th place. 5. Nahum (Humi) Prital and his partner Gal Cucuy competed in the “Combi” Latin category and made it to the 10th place at the Semi Finals. This was also the first time that Humi danced on his own, in his class of “Solo Men”, Class 2. He danced 5 dances and came in 8th place out of 13 participants. 6. Adam Greenfeld competed with his partner in the “Show” category and took 6th place out of 17 couples. 7. Anna Wishbein competed on her own for the first time ever in a “Solo Women’s” category. Accompanying the dancers was dancer, choreographer Yelena Feitliher who trains and practices with all the dancers throughout the year and choreographed all their dances.